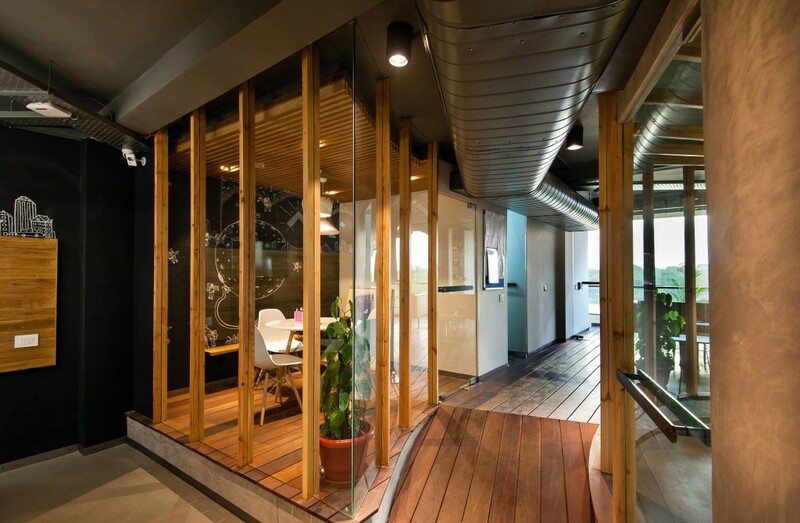 Indian realty search portal Housing.com recently announced that they have a new office for their design and product development team, located in Hauz Khas Village. A new office is always exciting, and the ambiance of this one was designed to boost productivity, and has ample lighting with good use of space. The design brief for the office demanded a quirky home-office feel, with the idea of breaking free from a structured layout to encourage free-flowing movement within the space. This was brought to life with organic seating plans, and a central conference room to contribute to this vision. To bring the scenic view of the lake indoors, there’s an angled feature wall with alternating mirror panels next to the workstation. The outdoor portions of the office were further designed as an extension of the indoor space, forming a large sweeping curve that follows the geometry of the layout organically. There is a bold use of colours to highlight brand identity, whiteboard painted walls, and the furnitures are designed with such a character as to further the concept of creating a young, buzzy atmosphere to encourage the spirit of experimentation amongst budding designers. Chromed, founded in 2010, is a mid-sized architecture and interior design consultancy firm based in New Delhi. They offer innovative, functional, and contemporary solutions for architecture, interior design, landscaping, and product design. They’re the ones behind the Housing.com office design. To learn more, visit their website or find them on Facebook.